Sombreo Bay is a Mediterranean-style restaraunt that offers a wide variety of Mexican cuisine, features Mariachi shows in the winter and a Marimba band all year long. Open for lunch and dinner 7 days a week. Av. Camaron Sabalo, across from Los Sabalos Resort Hotel. Pancho's Restaurant has an indoor/outdoor location alongside the sea and surf. 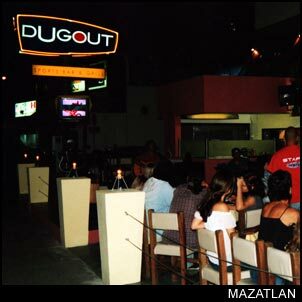 They serve a wide variety of steak, seafood, Mexican, and sandwich dishes, set in a casual, friendly environment. The Shrimp Factory serves a large selection of fresh seafood dishes and a few dishes for the non-seafood lover. Open for business from 12pm. till 11pm. Joe's Oyster Bar is a very popular beachfront drink emporium. They serve snacks and fresh seafood daily. "Happy Hour" all day. Open from 11am till 2am, located at Los Sabalos Resort Hotel. Mr. Tony's Bar and Grill is locatd a block south of the Cine Gaviotas movie theater, right on the corner. They really draw in a crowd with a live band almost every night. Tequila's offers a wide selection of tasty steak, seafood, poultry, Mexican, and sandwich dishes, served in a comfortable, friendly atmosphere. Indoor and outdoor seating available. Located across the street from the Hotel Costa de Oro. The Sheik Restauraunt is a very nice upscale place located within Fiesta Land, (next to Bora Bora and Valentinos) the Sheik offers a wide selection of steak, seafood, and poultry dishes, set in a gorgeous, tranquil environment with candles, soft piano music, sky lights, outside balcony, and the best sea-side view in town. Reservations are a must to guarantee seating (984-1616). Started by his grandmother 65 years ago, Gabino Urritia continues the tradition of delicious Mexican food. Restaurant employees wake up at 5:00 a.m. to shop the local markets to ensure the freshest ingredients every day. 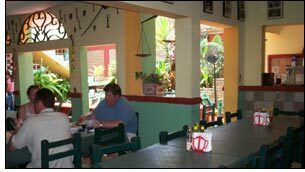 Voted the Best Restaurant in Mazatlan by American Express a few years ago, El Tunel has received many distiguished honors and guests. Every single item on the menu comes highly recommended by regulars, and I can honestly say they make the best guacamole I've ever had! They are open from noon to midnight every day, but you may have to wait for a seat at night, which speaks to this restaurant's well-earned popularity. Very reasonably priced. Located on Avenue Carnaval at the Plazuela Machado, across from the Teatro Angela Peralta. *Afterwards, treat yourself to tea, coffee, or a selection from more than 40 kinds of cake at Gabino's sister's upscale place, Memorial Cafe, right next door! This open air restaurant hosts a breakfast buffet, lunch, and dinner. They offer a seemingly infinite selection of seafood dishes and a green salad loaded with avacado. Kind of pricy, but some think it's worth it for the ocean breeze, passing ships, and the view of Stone Island. After your meal, you can visit the statue of the Virgin of la Puntilla, located just across the parking lot. At the beginning of each hurricane season, fishermen's wives make offerings to her to protect their loved ones at sea. This cantina was very busy the afternoon I was there- jukebox playing while the televisions showed a soccer game. Chickens ran past as vendors offered wallets, DVDs, and shoeshines. They do serve food, but the best part was the live music and $1 beers!